This year, Passover begins at sunset on April 22 and concludes at sunset on April 30. Passover, one of the most sacred and celebrated of Jewish holidays, is celebrated by utilizing special foods and a dinner (Seder) prepared and shared with family and friends. The Seder (which means order) is the service, conducted at home, that tells the story of Moses and the Israelites’ lives under Egyptian rule and their departure from slavery into freedom in Israel. There are very specific dietary laws governing what can and can’t be eaten during Passover. Simply put, you are forbidden to eat anything that contains barley, wheat, rye, oats and spelt, except for matzo and matzo meal products, which are all made under the strict supervision of a rabbi and/or kosher-certifying organization. Roasted egg: A symbol of sacrifices made in biblical times. It is also a symbol of spring. 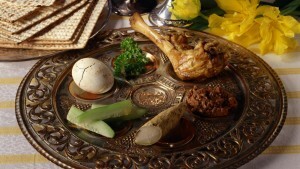 Lamb shank bone: Represents the Paschal lamb offered as the Passover sacrifice in biblical times. Charoses: Apple or other fruits, nuts, and spices mixed together with wine or grape juice symbolizing the mortar used by Hebrew slaves to build pyramids. Karpas/parsley: To be dipped into salt water during the Seder. The salt water serves as a reminder of the tears shed during Egyptian slavery. Maror/bitter herbs (usually horseradish): Represents the bitterness of slavery. Chazeret/lettuce: A second bitter herb, used in what most call the Hillel sandwich, it consists of matzah, a piece of bitter herbs and charoses. While every family has its own food traditions passed from generation to generation some are written in stone (forgive the pun) while others are more flexible. In my home, the meal wouldn’t be complete without serving my mother’s recipe for chicken soup and matzo balls, my Aunt Maureen’s hot fruit compote and my grandmother’s sponge cake. While these foods are sacrosanct, I do tend to mix it up a bit when it comes to Passover desserts. The following recipes are so good they can be used year-round as well as during the week of Passover. For the savory crust, I use roasted vegetables and have topped them with Parmesan. I’ve also scrambled eggs and salami or sautéed mushrooms and filled the shell with mixture. Preheat the oven to 350 degrees. Grease a 9-by-13 pan and set it aside. In a bowl combine the apples with the brown sugar and 1/4 cup orange juice. Mix to combine and set aside. In another bowl combine 1/2 cup of warm water and 1/4 cup orange juice. Add the cookie crumbs and let them soak until soft for 3 to 4 minutes. In another bowl, combine the eggs, salt, sugar and cinnamon. Whisk to combine then add the melted butter, raisins, and apricots. Mix to combine. Drain the liquid from the softened cookies (just squish it out with your hands) and add the cookie mix to the egg mixture. Add the apples to the egg mixture and combine. Pour the mixture into the prepared pan. And sprinkle the nuts and cinnamon sugar over the top, if using. Dot the small pieces of butter or margarine over the top. Cover with foil and bake for 20 minutes. Remove the foil and bake an additional 40 minutes. Bake the kugel for 35 to 45 minutes. Remove from the oven and let set for at least 10 minutes before serving. You can also make this recipe up to 2 days ahead of time and reheat. Serves 10. For the best looking dipped figs, pinch them back to their original tear drop shape before dipping. Place the chopped nuts in a bowl and set them aside. Place the chips in a microwave bowl. Microwave for 20 seconds and check to see if all the chips have melted. Stir until smooth. Hold the stem of the fig and dip the fig halfway into the melted chocolate and then dip the fig into the chopped nuts, making sure to coat it evenly up the sides. Place the dipped fig onto a cookie sheet lined with parchment paper. (You can microwave if the chocolate becomes too hard). Let the figs set up in a cool place (not the refrigerator) for at least an hour before serving. Best served at room temperature. In the bowl of a food processor combine the walnuts and a 1/4 cup sugar and pulse until finely ground. Add the matzo meal, zest, cinnamon, and salt and pulse to combine. In a bowl of an electric mixer beat the egg whites until they form soft peaks. Add the remaining sugar and beat until you have stiff peaks. By hand, fold the yolk mixture in the white mixture one third at a time. Then, by hand, fold the nut mixture into the egg mixture. Spoon the batter into the prepared pan. Bake 35 to 40 minutes. Cool in the pan for at least 30 minutes before taking the cake out of the pan. You can dust the top powdered sugar if you like. Serves 8.